The North Carolina Department of Transportation began distributing more than $147.4 million in “state street aid” to 508 municipalities across the Tar Heel state on Sept. 26 – monies generated from North Carolina’s gas tax and other highway user fees via the Powell Bill fund – with another multi-million dollar allocation set to be sent out on Dec. 31. The fund is named for Junius K. Powell, a former state senator and mayor of Whiteville, N.C. who was a primary sponsor of the 1951 bill to help the state’s cities with urban road problems. The overall total of aid has reached just over $4.5 billion, NCDOT noted in a statement. Per the Powell Bill requirements, NCDOT said this funding is to be used primarily for the resurfacing of streets within the corporate limits of a municipality, but it can also fund repairing, constructing, reconstructing or widening of any street or public thoroughfare – including bridges, drainage, curbs and gutters – as well as pay for planning, construction and maintenance of bikeways, greenways or sidewalks. Municipal officials are responsible for the proper management of these funds, the agency added. The agency noted that the funding each municipality receives is based on a formula set by the N.C. General Assembly, with 75 percent of the funds based on population and 25 percent based on the number of locally maintained street miles. This year, that broke down to $110.5 million for population and $36.8 million based on street miles, it said. NCDOT added that 23 cities are receiving at least $1 million, led by Charlotte at $20.5 million, based on its population of 845,235 and 2,480 miles of maintained roads. Raleigh will receive $10.7 million, followed by Greensboro ($7.2 million), Winston-Salem ($6.4 million), Durham ($6.3 million) and Fayetteville ($5.2 million). 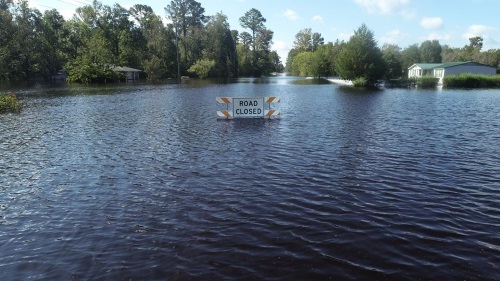 The agency also noted that its Hurricane Florence recovery efforts are continuing, involving more than 2,600 NCDOT employees and 160 contractors who are aiding with cleanup and recovery. North Carolina now has less than 300 closed sections of roadway, the agency added, down from more than 1,600 during the peak of the storm. According to news reports, the monetary damage inflicted by Hurricane Florence on North Carolina’s transportation network could top $266 million.